Working from home may seem a bit lonely, but I guarantee that you are having an impact – on the environment, that is. Whether a cubicle, a corner office, or a corner of your living room, office spaces generate a lot of waste, much of which can be reused and recycled. Even if you are the only employee in your humble office, printer paper, empty highlighters, and ink cartridges add up quickly. Here are 5 easy ways to reduce that eco-impact you don’t want your writing to have. 1) Your computer is the heart of your office. The next time you are in the market for a new laptop or desktop, look for those that are Energy Star-certified. Certified computers are proven to use energy more efficiently, helping them last longer and save you money (up to $100 every year!). 2) Install the GreenPrint software on your computer. Available in 3 versions, the free software does exactly what you need it to do: remove unnecessary pages, text, or images from all your printing jobs. You’ll save paper, ink, and the electricity used to run your printer. 3) When you do print, buy and use 100% post-consumer recycled paper. Just as strong and attractive as “regular” paper, zero trees were cut down to make your 500-sheet ream. The usual office supply stores (Stapes, Office Max, Office Depot … etc.) all sell 100% post-consumer papers, but you can also buy them from specialty eco-paper companies and shops like New Leaf and Eco Green Office. 4) While were on the subject of paper, stock up on other eco-friendly office supplies too! Pens, pencils, paper clips, staples, push pins, sticky notes—all your basic office supplies have more sustainable versions available at almost identical prices (you’re writing-off your supplies on your taxes anyway, aren’t you?). 5) Beware the particleboard! Cheap office furniture is tempting, but it is often produced at the discount of the environment. If you need a new desk, shop for a vintage or second-hand piece. No only will be likely be more affordable and long-lasting, older desks have a lot more personality (and, therefore, inspiration). This is just the tip of the eco-home office iceberg, but the key is getting started. Take that first step to run a more sustainable office, developing planet-conscious habits each time you turn on your computer, print a manuscript, or stock up on supplies. 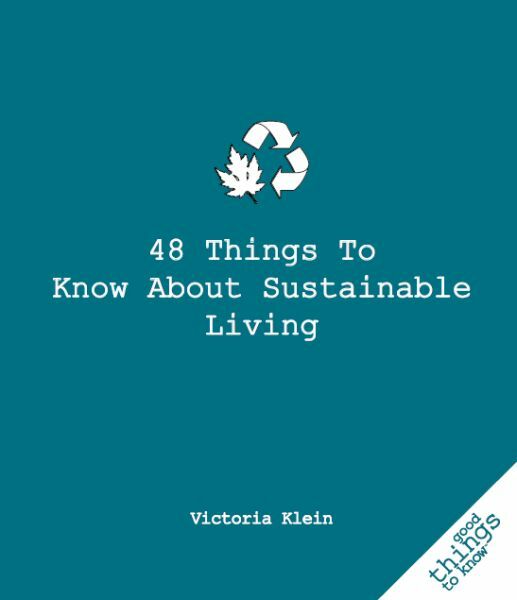 To help integrate sustainability into even more areas of your life, 48 Things to Know About Sustainable Living is the only guide you need. Adapted with permission from 48 Things to Know About Sustainable Living by Victoria Klein ©2010 by Victoria Klein. 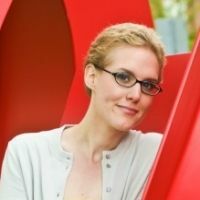 Victoria Klein is a freelance writer and yoga practitioner who also dabbles in photography, crafts, and running. Her 2nd book, 48 Things to Know About Sustainable Living, was released October 2010; 27 Things to Know About Yoga is her 1st book. Very helpful information. I did not know about green printing and will check that out. I have always been very conscious of how much paper I used and tried to cut back whenever possible. Back in the day when manuscripts were sent back and forth in the mail, it was recommended to reprint each time so the submission looked fresh. Instead of reprinting an entire ms, I would just reprint the first few pages. You know, Maryann... we need to do a separate post about the new(ish) manuscript submission procedures - electronic vs. printed. Companies who want paper submissions are just archaic these days. And that change happened very suddenly in the past few years. I'm glad you enjoyed the post, Maryann :) It sounds like you have been running a sustainable home office for awhile now! Love your book, Victoria, and my husband and I were pleased to see how many of your tips we already apply. You gave us some we hadn't thought of, though. thanks! Excellent tips. I've always recycled all my paper and print on both sides. The politically correct reason is because it's green, but before that it was because I was cheap. Why use more paper than you have to? Fascinating. I really hadn't thought about that sort of thing. Perhaps Christmas, and a contract, is a good incentive to try. Thanks for the tips. Great advice! Glynis: The CFL bulbs? Yes, they are a great, easy sustainable change to make. While it is a great option, the tips I did feature have a bit of a bigger impact than just the bulbs ... or maybe I assumed that most folks were already using them ;) The next bulb change? LEDs! I particularly liked your "Buy used or vintage instead of particle board" tip! You can get much nicer, more interesting stuff that way, and way better quality! I couldn't agree more, "other" Lisa!! I do have lots of paper cluttering my desk. I'll have to try some of these recommendations. Make a list of furniture that you really need for your home office to see much you can allocate for this project. It will save you time and money on your shopping. If you are concern with your space in your home office, you can try the stackable office chairs. It's practical and can be stylish too.